The Superman Fan Podcast: Episode #385 Part V: Superman Family Comic Book Cover Dated August 1965: Superman's Girl Friend Lois Lane #59! Boy, Lois really comes off in a very bad light in the first two stories in this issue. In "Lois Lane's Super-Perfect Crime", I agree with you that she should have been facing some serious charges, regardless of the influence of the invulnerability serum. Also, if I'd been told to drink a glass of milk each day to avoid bad side effects, I think I'd drink it the first thing in the morning, with breakfast, so I wouldn't forget it. 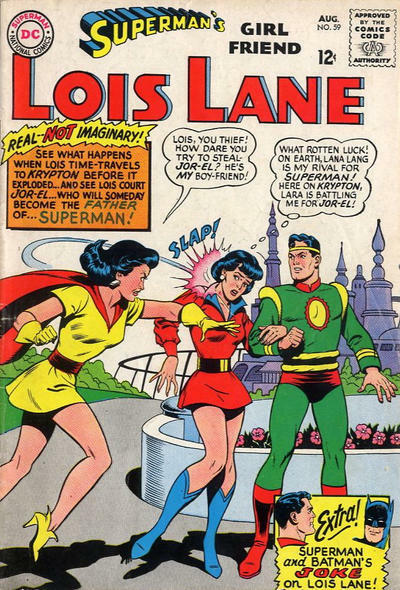 When Lois put on a red wig to disguise herself as Lana, I wouldn't think that would have been enough to fool Superman. Of course, since all these things took place in Lois' hallucination, we really can't subject them to too much scrutiny. "Superman and Batman's Joke on Lois Lane", on the other hand, doesn't really make anyone look good. Lois is the stereotypical "snoopy Lois", trying to uncover Superman's secret identity and marry him, and Superman and Batman seem to enjoy thwarting Lois' plan way too much. You make a good point about Lois' previous visits to Kandor. I'd forgotten about those stories. In the final story, it seemed that Batman and Superman enjoyed playing a prank on Lois a bit too much. I think the writers and editors had a really poor opinion of Lois. As Halk-Kar said, she comes off really bad this issue. Ditzy. Needy. Jealous. Mean-spirited. Air-Headed. She's like the comic book version of Lucille Ball from I Love Lucy, always getting entangled in some "crazy scheme". If I were a female reader in 1965, I'd be giving the editors a piece of my mind. A lot of women probably did, they just didn't print those letters. None of the female characters in the entire issue are presented in a positive light. It is fitting that you gave two of the stories a zero and one a "C". Well, maybe the next issue will be a winner! Keep up the good work and happy new year! Thank you, and may you have a great year. What's most disturbing about the way that women were portrayed in these stories is that it was probably the way the DC staff at the time thought about women. It sheds a little bit of light on why women today are becoming less tolerant of sexism and chauvinism.